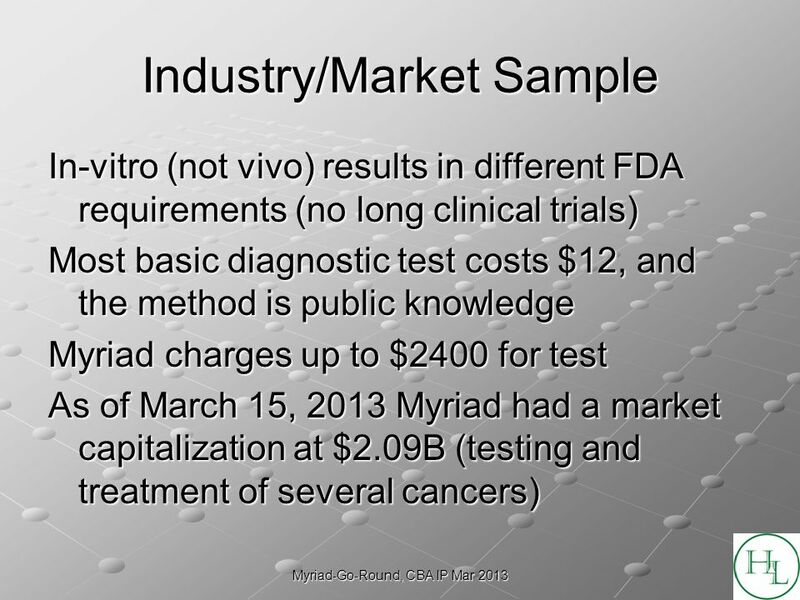 Myriad-Go-Round, CBA IP Mar 2013 Myriad-Go-Round The current state of gene patents. 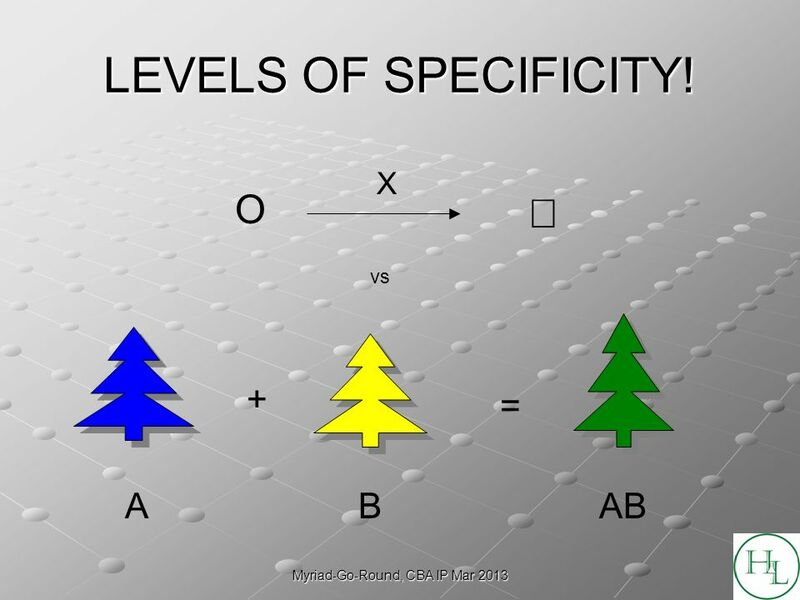 7 Myriad-Go-Round, CBA IP Mar 2013 Gene Sequences Specificity: How low can you go? 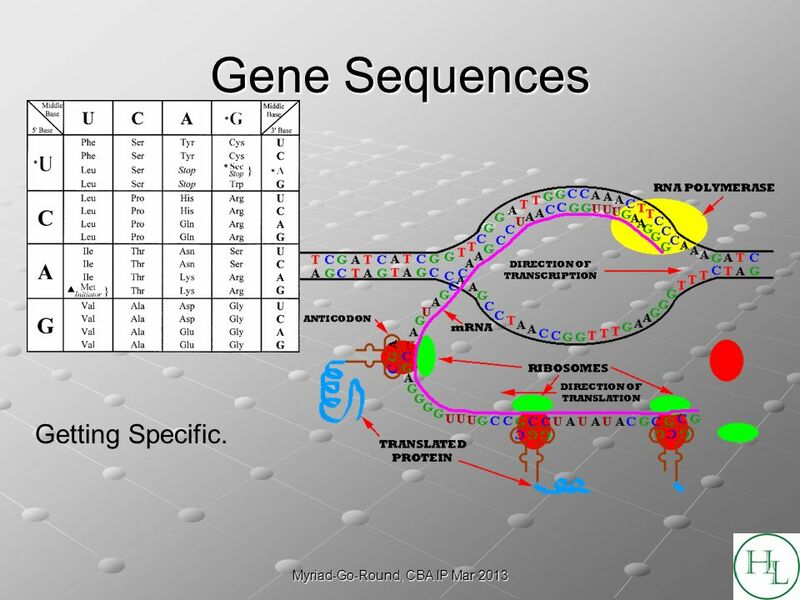 8 Myriad-Go-Round, CBA IP Mar 2013 Gene Sequences Getting Specific. 14 Myriad-Go-Round, CBA IP Mar 2013 TJs Policy He who receives an idea from me, receives instruction himself without lessening mine; as he who lights his taper at mine, receives light without darkening me. That ideas should freely spread from one to another over the globe, for the moral and mutual instruction of man, and improvement of his condition, seems to have been peculiarly and benevolently designed by nature, when she made them, like fire, expansible over all space, without lessening their density in any point, and like the air in which we breathe, move, and have our physical being, incapable of confinement or exclusive appropriation. Inventions then cannot, in nature, be a subject of property. 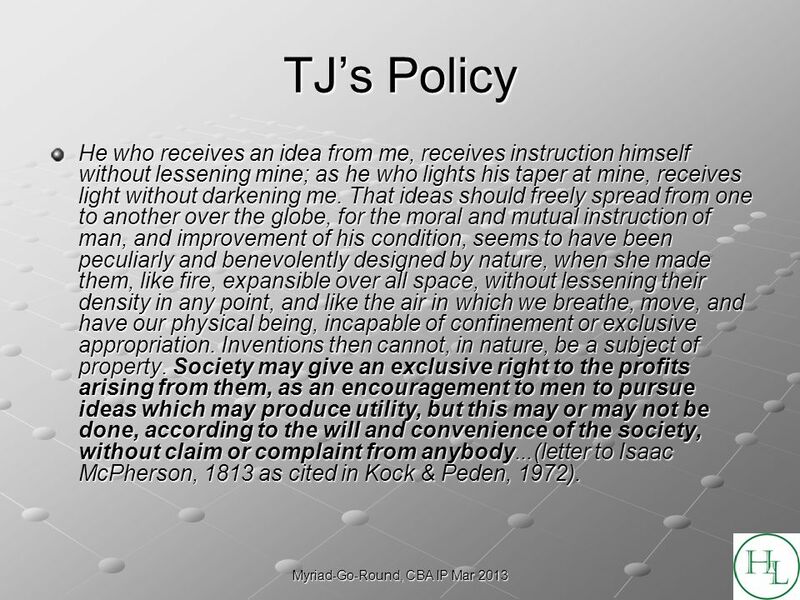 Society may give an exclusive right to the profits arising from them, as an encouragement to men to pursue ideas which may produce utility, but this may or may not be done, according to the will and convenience of the society, without claim or complaint from anybody...(letter to Isaac McPherson, 1813 as cited in Kock & Peden, 1972). 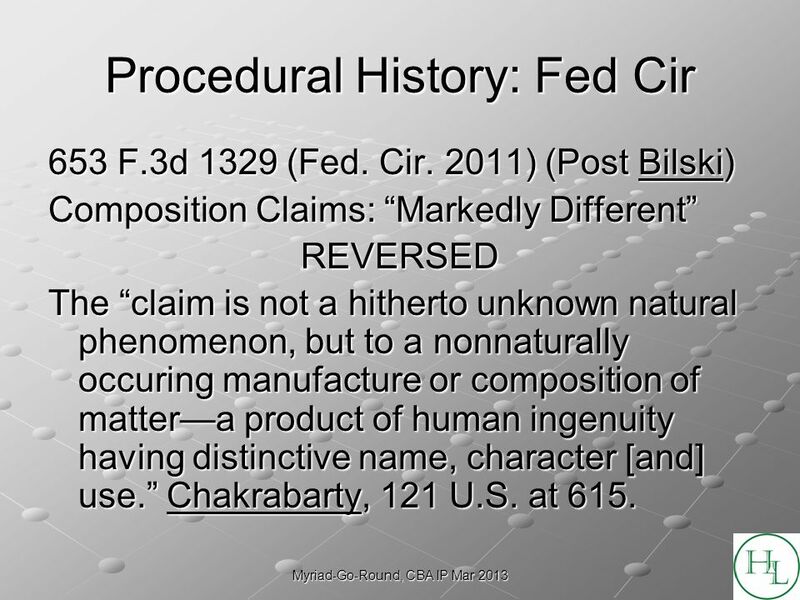 15 Myriad-Go-Round, CBA IP Mar 2013 Patentable Subject Matter 35 USC §101 35 USC §101 : Whoever invents or discovers any new and useful process, machine, manufacture, or composition of matter, or any new and useful improvement thereof, may obtain a patent therefor, subject to the conditions and requirements of this title. 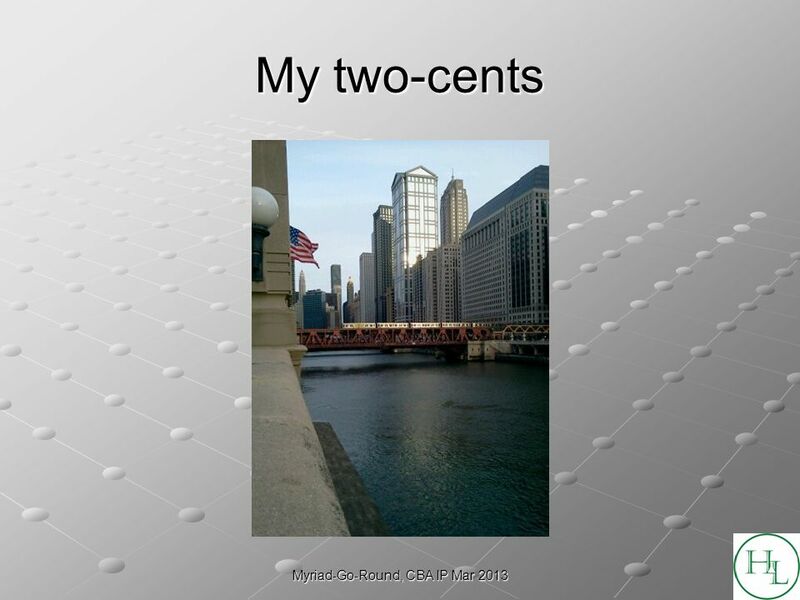 19 Myriad-Go-Round, CBA IP Mar 2013 Bilski: will the Fed Cir ever learn? 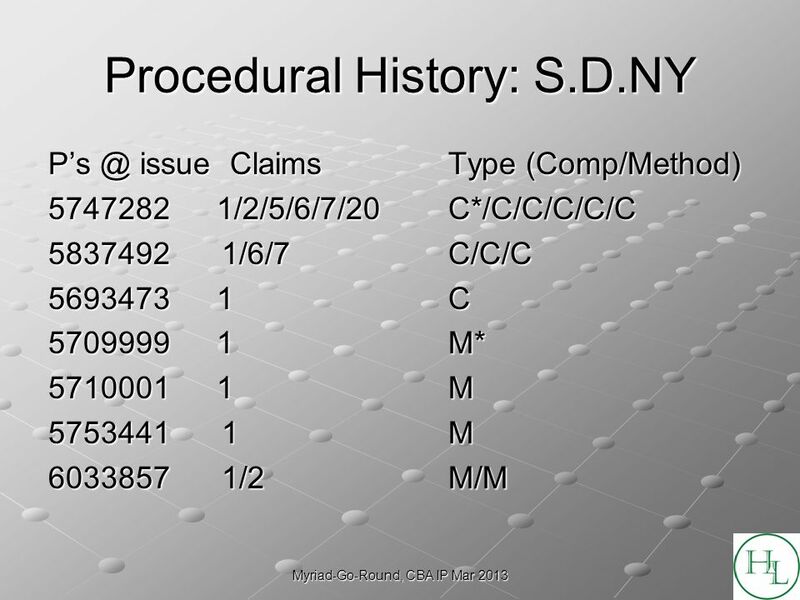 A claimed process is surely patent-eligible under §101 if: 1) it is tied to a particular machine or apparatus, or 2) it transforms a particular article into a different state or thing. --In re Bilski, 545 F.3d 943, 88 U.S.P.Q.2d 1385 (Fed. Cir. 2008). 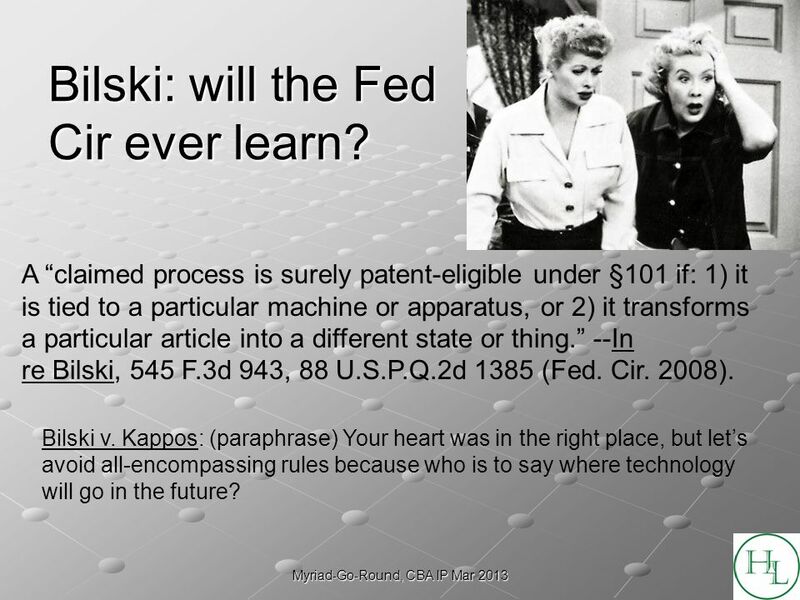 Bilski v. Kappos: (paraphrase) Your heart was in the right place, but lets avoid all-encompassing rules because who is to say where technology will go in the future? 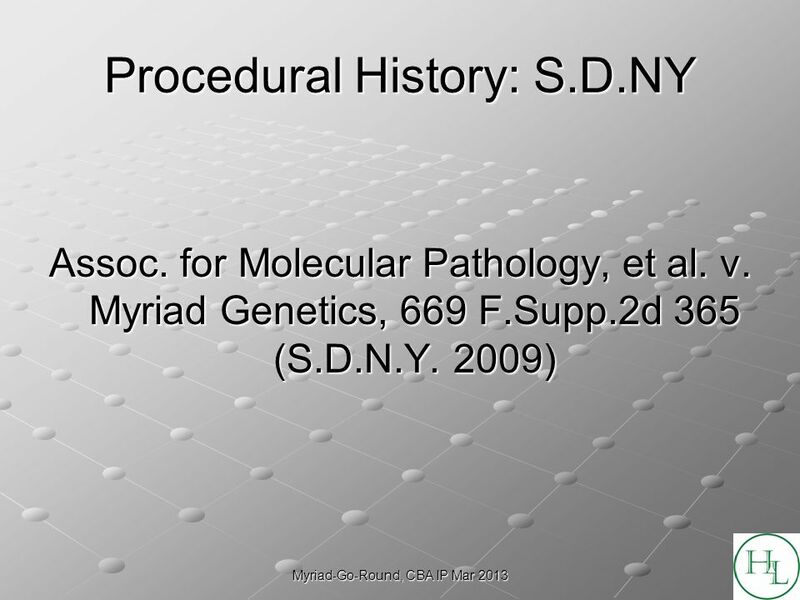 22 Myriad-Go-Round, CBA IP Mar 2013 Procedural History: S.D.NY Composition Claims: Products of Nature = Markedly Different Rule the patentee has produced a new bacterium with markedly different characteristics from any found in nature and one having the potential for significant utility. 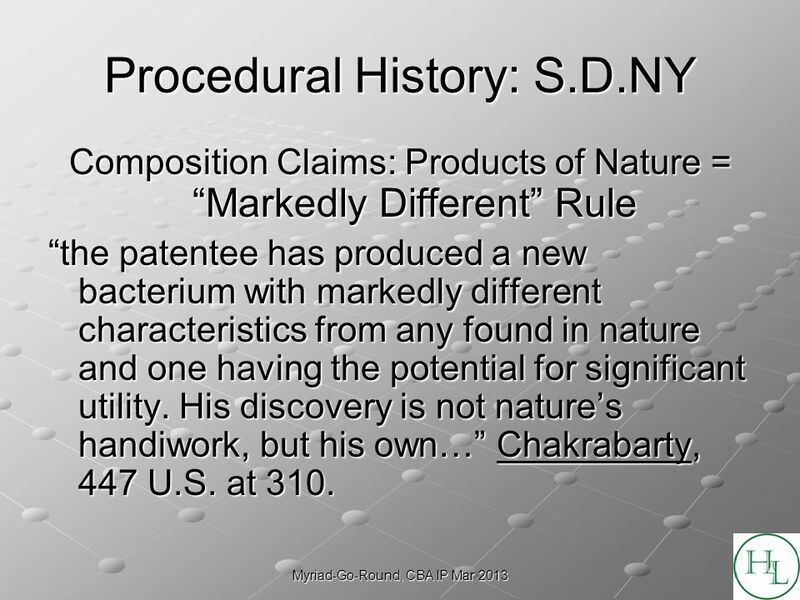 His discovery is not natures handiwork, but his own… Chakrabarty, 447 U.S. at 310. 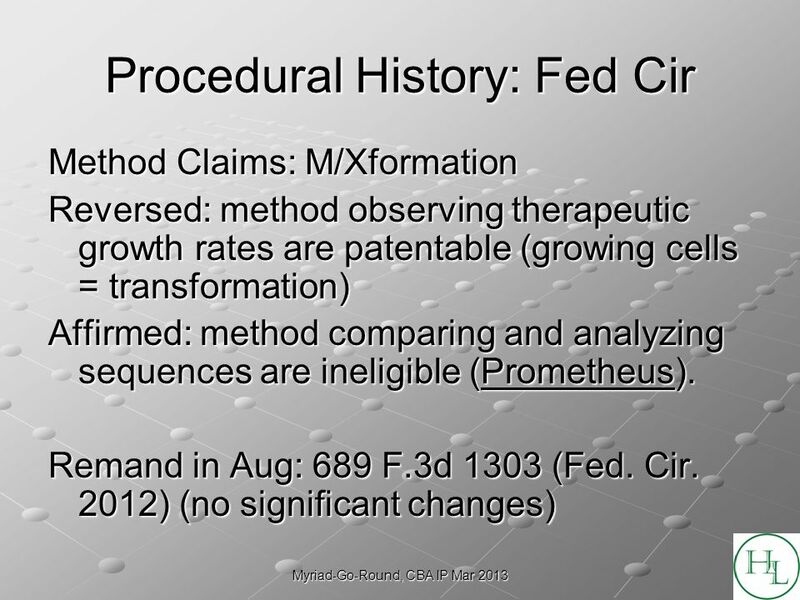 25 Myriad-Go-Round, CBA IP Mar 2013 Procedural History: Fed Cir 653 F.3d 1329 (Fed. Cir. 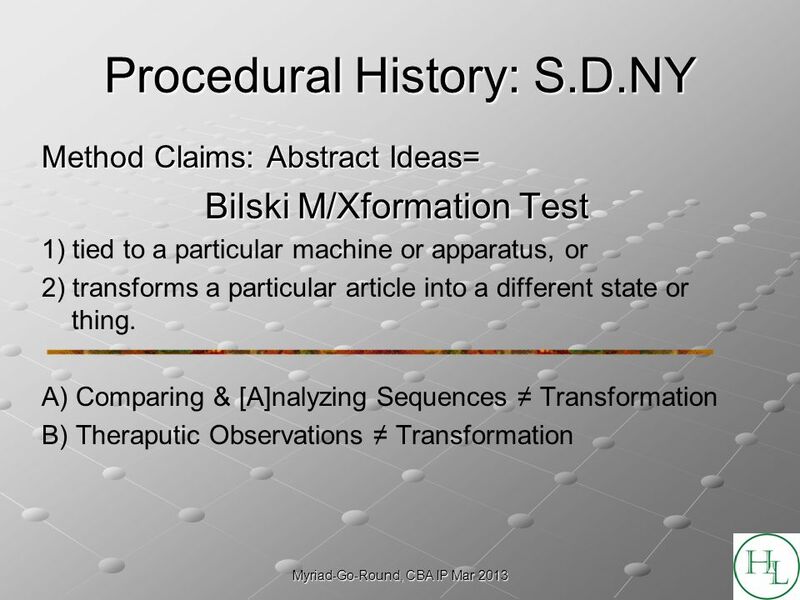 2011) (Post Bilski) Composition Claims: Markedly Different REVERSED The claim is not a hitherto unknown natural phenomenon, but to a nonnaturally occuring manufacture or composition of mattera product of human ingenuity having distinctive name, character [and] use. Chakrabarty, 121 U.S. at 615. 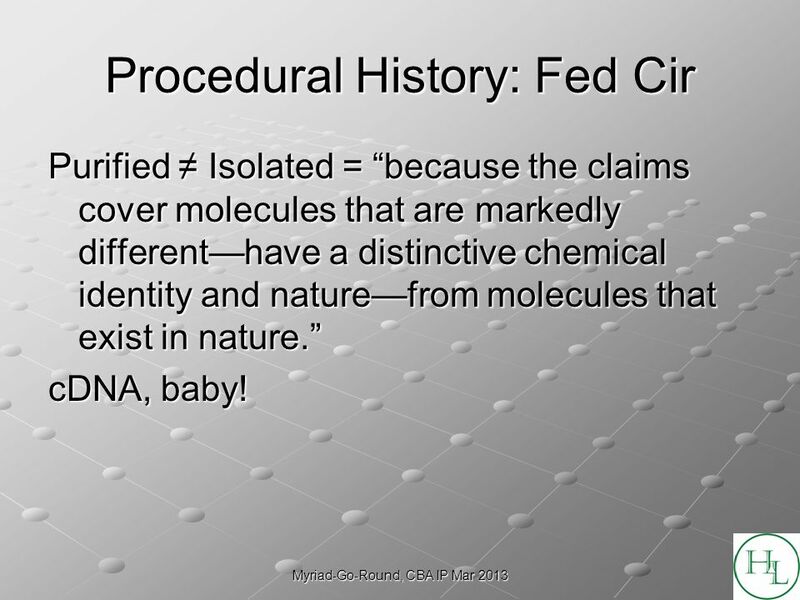 26 Myriad-Go-Round, CBA IP Mar 2013 Procedural History: Fed Cir Purified Isolated = because the claims cover molecules that are markedly differenthave a distinctive chemical identity and naturefrom molecules that exist in nature. 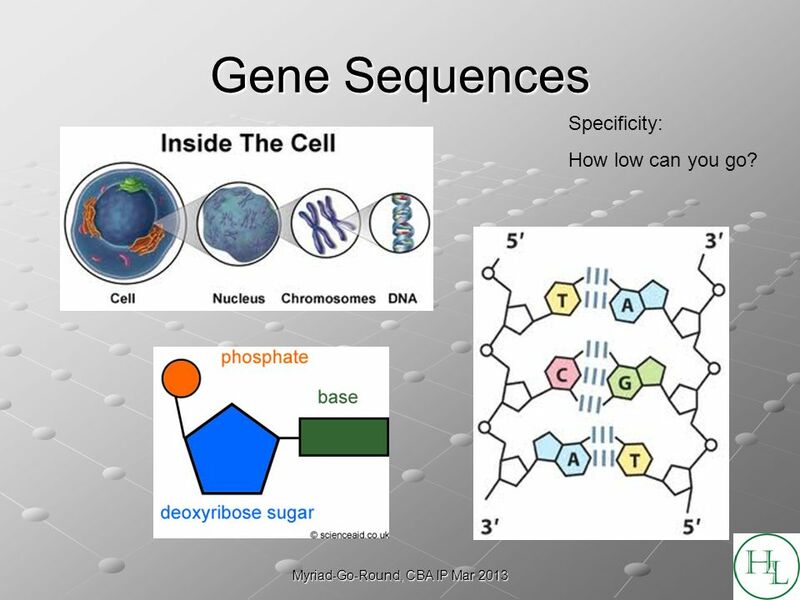 cDNA, baby! 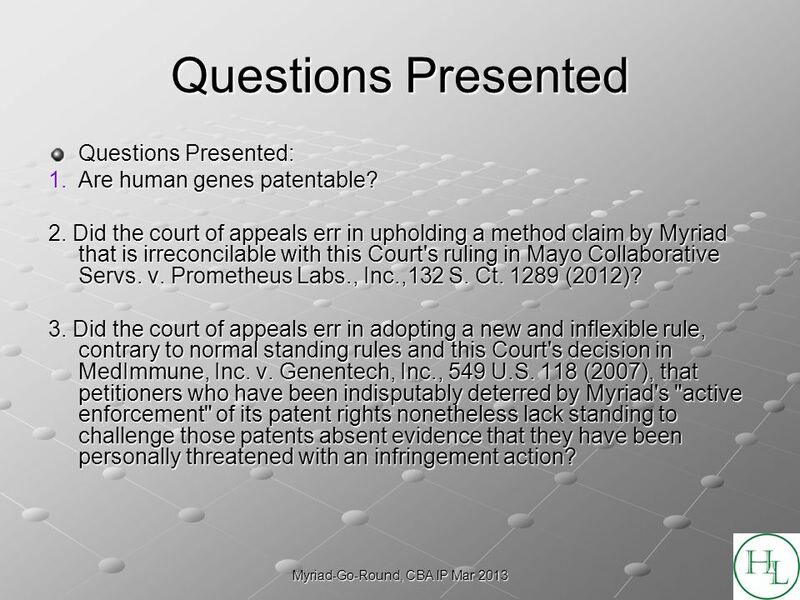 29 Myriad-Go-Round, CBA IP Mar 2013 Questions Presented Questions Presented: 1.Are human genes patentable? 2. 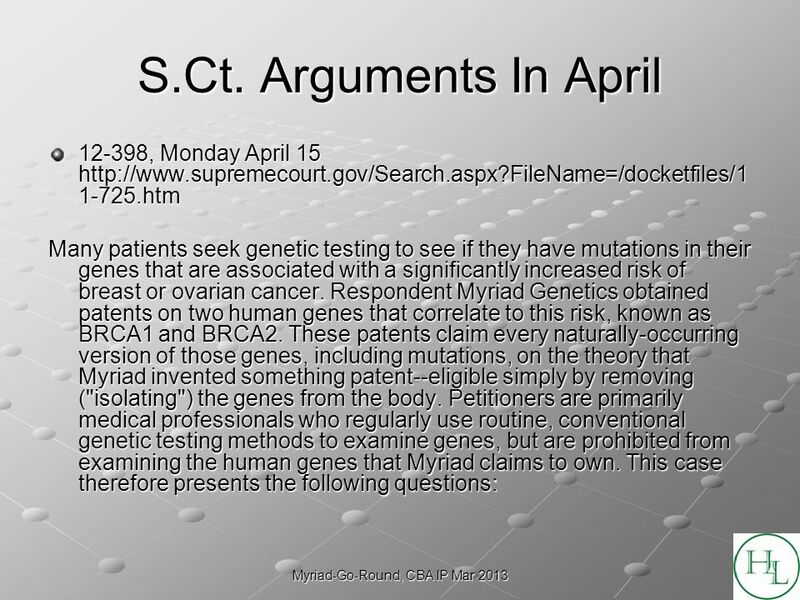 Did the court of appeals err in upholding a method claim by Myriad that is irreconcilable with this Court's ruling in Mayo Collaborative Servs. v. Prometheus Labs., Inc.,132 S. Ct. 1289 (2012)? 3. 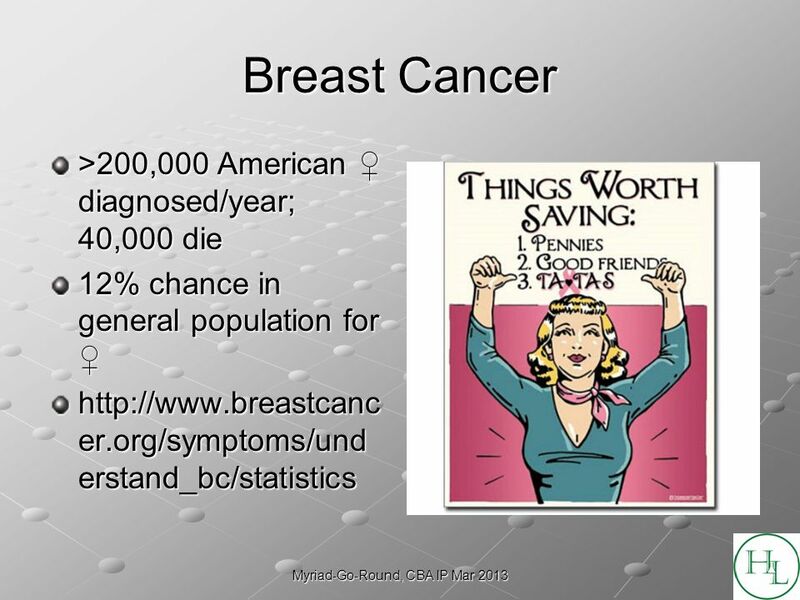 Did the court of appeals err in adopting a new and inflexible rule, contrary to normal standing rules and this Court's decision in MedImmune, Inc. v. Genentech, Inc., 549 U.S. 118 (2007), that petitioners who have been indisputably deterred by Myriad's "active enforcement" of its patent rights nonetheless lack standing to challenge those patents absent evidence that they have been personally threatened with an infringement action? 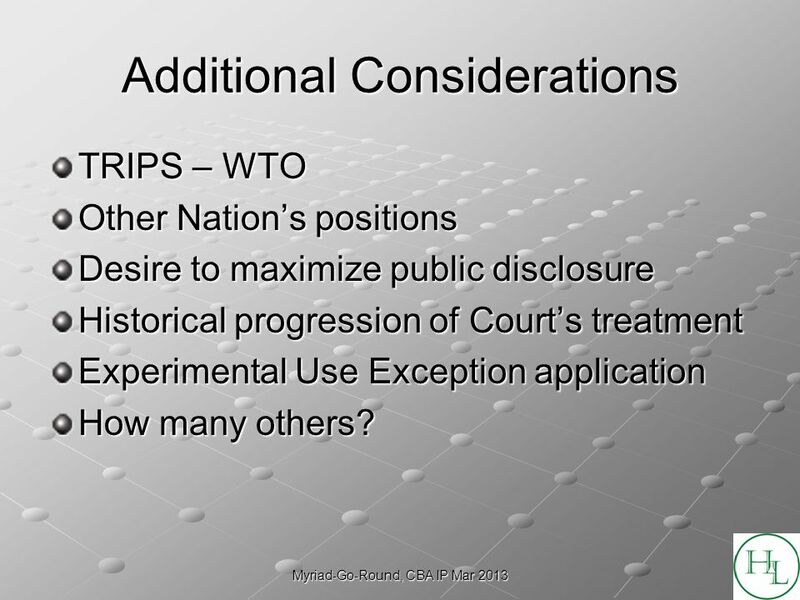 30 Myriad-Go-Round, CBA IP Mar 2013 Additional Considerations TRIPS – WTO Other Nations positions Desire to maximize public disclosure Historical progression of Courts treatment Experimental Use Exception application How many others? 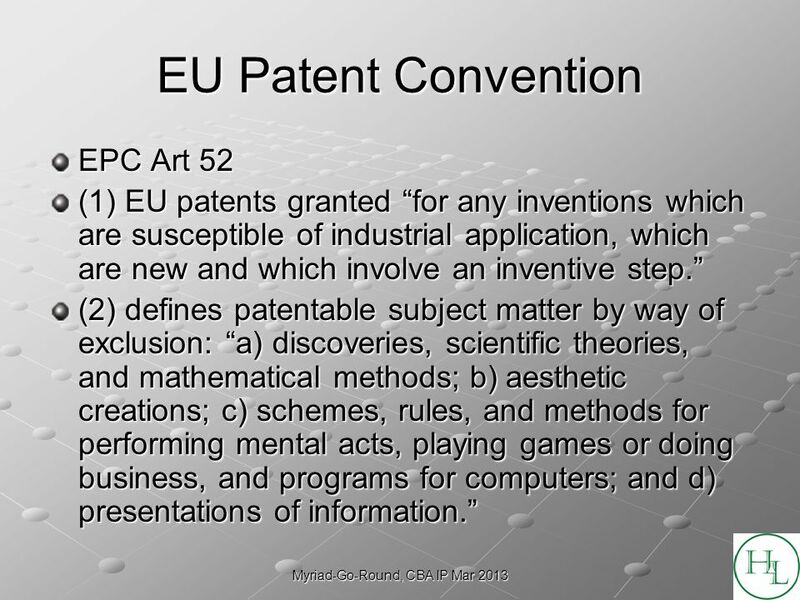 31 Myriad-Go-Round, CBA IP Mar 2013 EU Patent Convention EPC Art 52 (1) EU patents granted for any inventions which are susceptible of industrial application, which are new and which involve an inventive step. 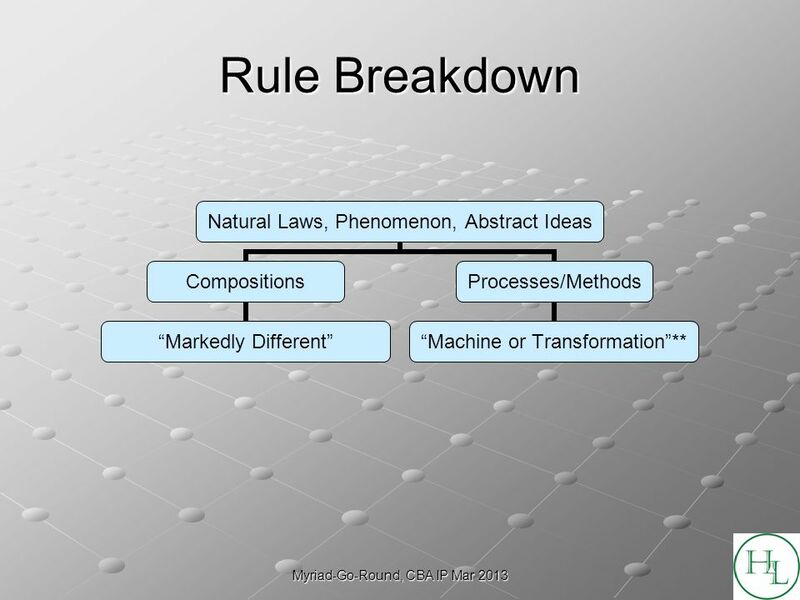 (2) defines patentable subject matter by way of exclusion: a) discoveries, scientific theories, and mathematical methods; b) aesthetic creations; c) schemes, rules, and methods for performing mental acts, playing games or doing business, and programs for computers; and d) presentations of information. 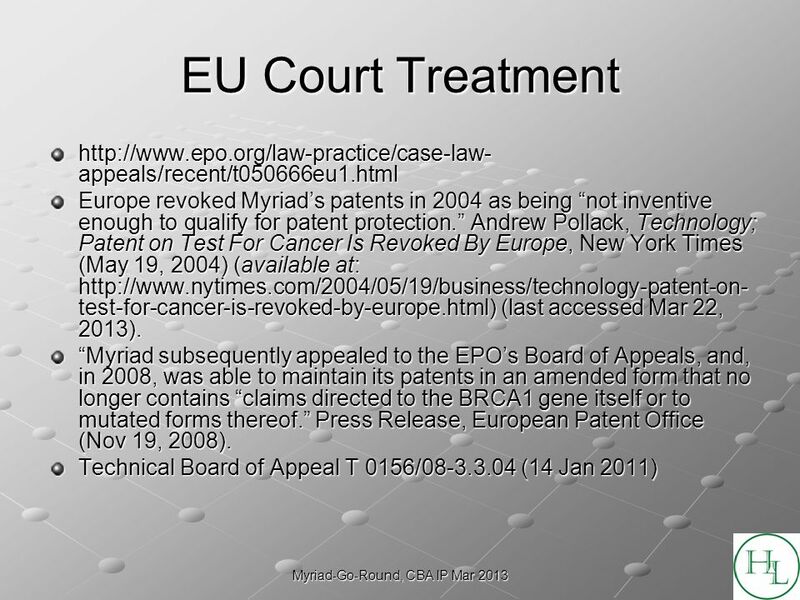 33 Myriad-Go-Round, CBA IP Mar 2013 AU Decision Cancer Voices Australia v. Myriad Genetics Inc,  FCA 65 (15 Feb 2013) Sec 18(1)... an invention is a patentable invention for the purposes of a standard patent if the invention, so far as claimed in any claim: (a) is a manner of manufacture within the meaning of section 6 of the Statute of Monopolies; and (b) when compared with the prior art base as it existed before the priority date of that claim: (i) is novel; and (ii) involves an inventive step; and (c) is useful; and (d) was not secretly used in the patent area before the priority date of that claim by, or on behalf of, or with the authority of, the patentee or nominated person or the patentees or nominated person's predecessor in title to the invention. 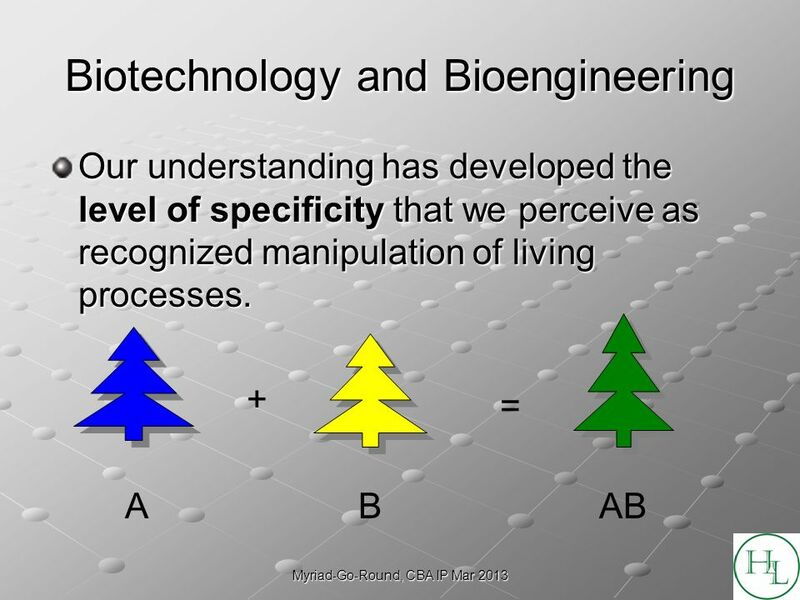 Sec18(2)-(4): (2) Human beings, and the biological processes for their generation, are not patentable inventions. 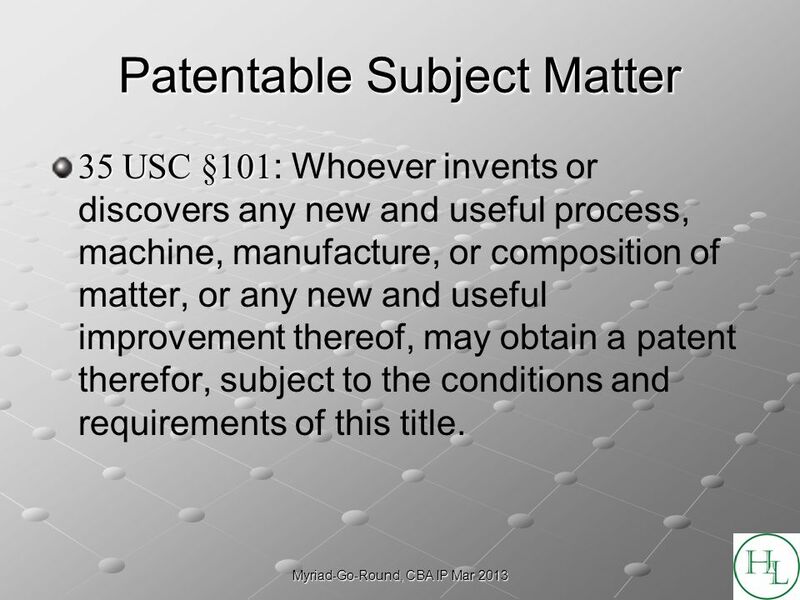 (3) For the purposes of an innovation patent, plants and animals, and the biological processes for the generation of plants and animals, are not patentable inventions. 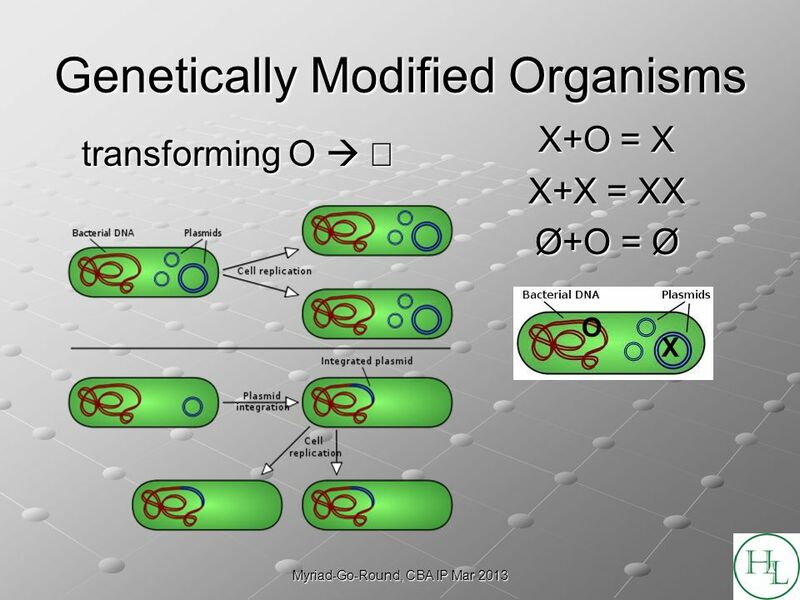 (4) Subsection (3) does not apply if the invention is a microbiological process or a product of such a process. 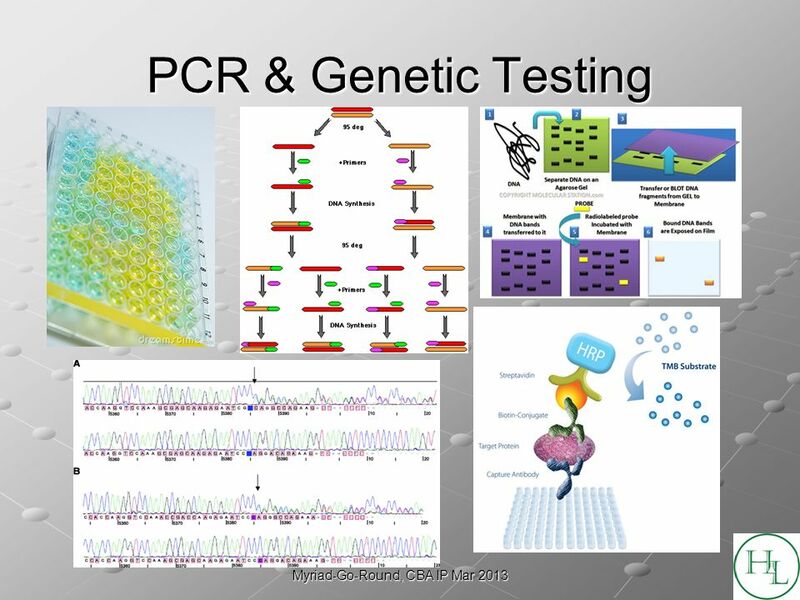 34 Myriad-Go-Round, CBA IP Mar 2013 AU Decision There is no doubt that naturally occurring DNA and RNA as they exist inside the cells of the human body cannot be the subject of a valid patent. 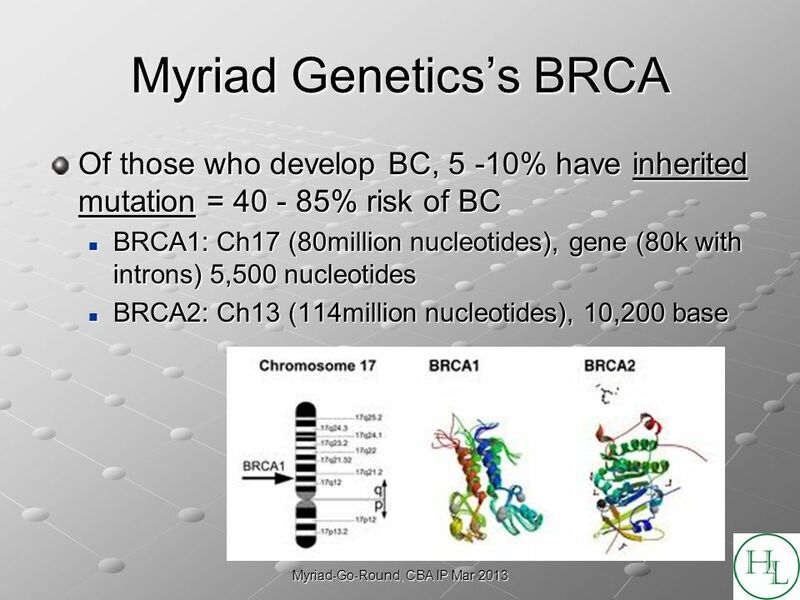 However, the disputed claims do not cover naturally occurring DNA and RNA as they exist inside such cells. 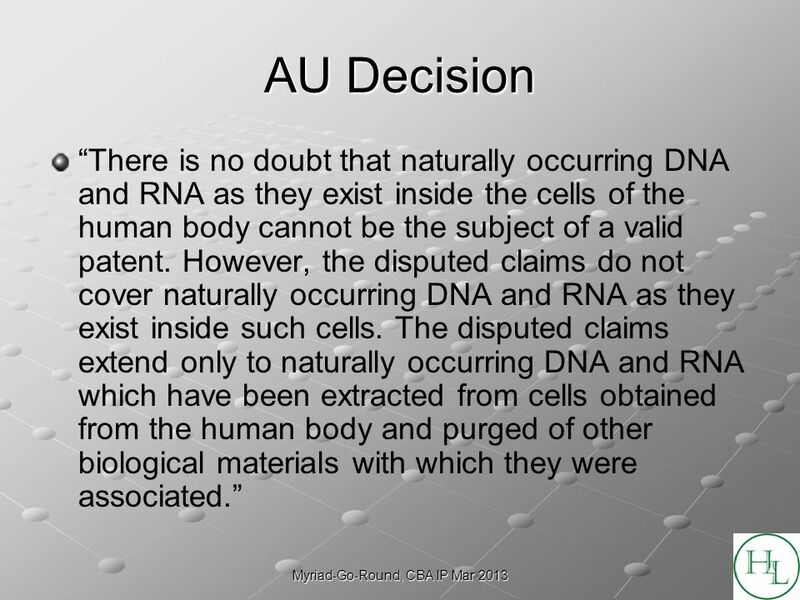 The disputed claims extend only to naturally occurring DNA and RNA which have been extracted from cells obtained from the human body and purged of other biological materials with which they were associated. 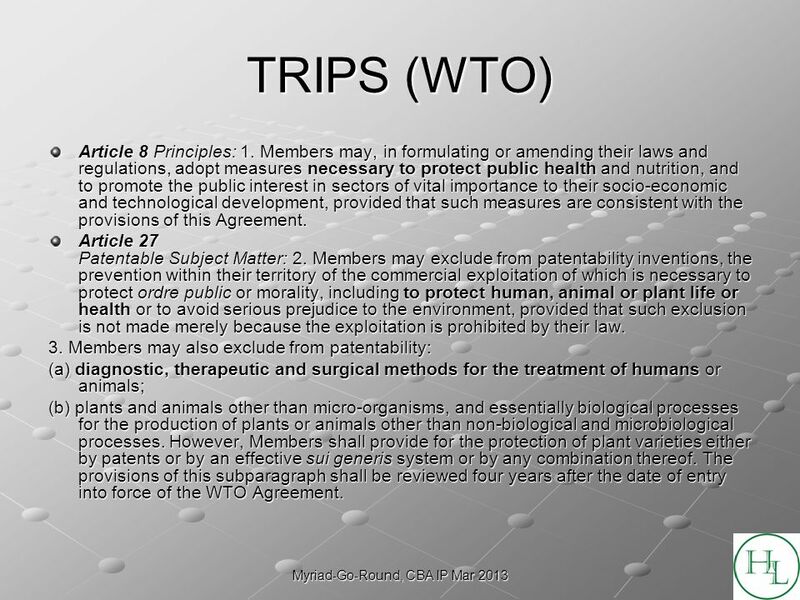 35 Myriad-Go-Round, CBA IP Mar 2013 TRIPS (WTO) Article 8 Principles: 1. Members may, in formulating or amending their laws and regulations, adopt measures necessary to protect public health and nutrition, and to promote the public interest in sectors of vital importance to their socio-economic and technological development, provided that such measures are consistent with the provisions of this Agreement. 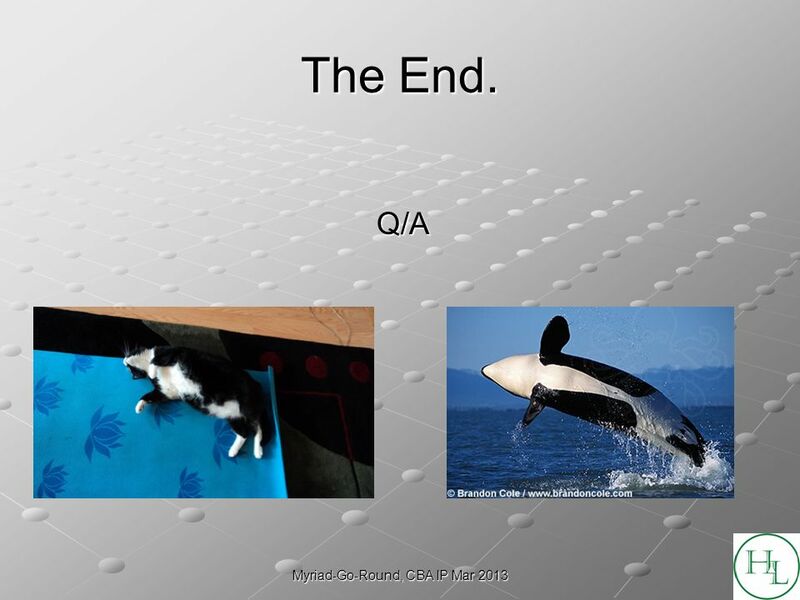 Article 27 Patentable Subject Matter: 2. 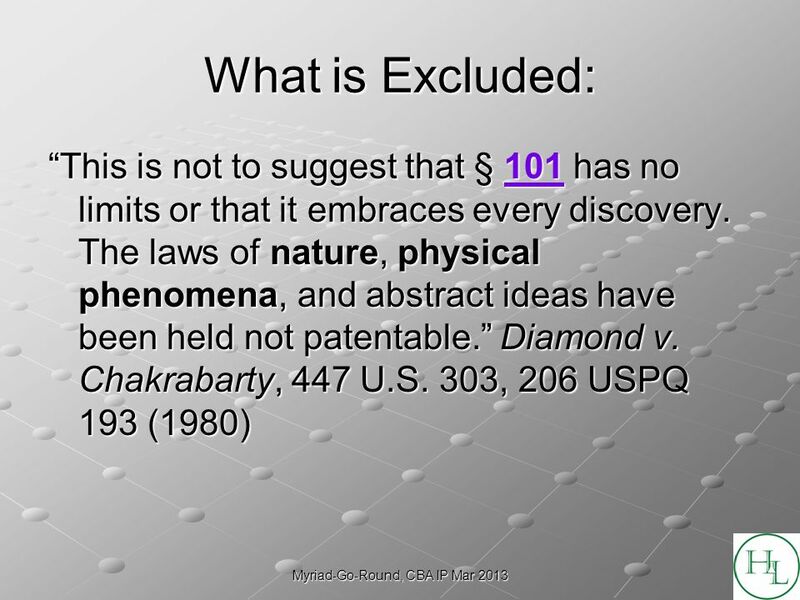 Members may exclude from patentability inventions, the prevention within their territory of the commercial exploitation of which is necessary to protect ordre public or morality, including to protect human, animal or plant life or health or to avoid serious prejudice to the environment, provided that such exclusion is not made merely because the exploitation is prohibited by their law. 3. 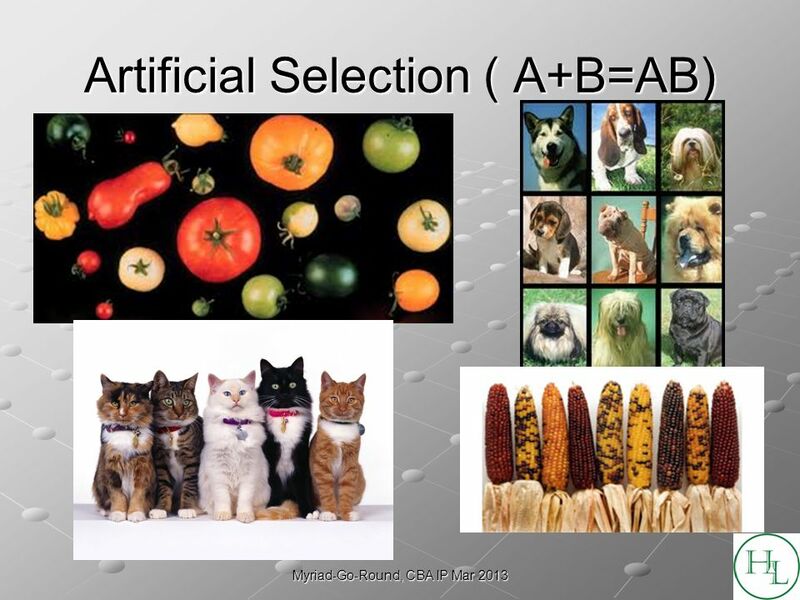 Members may also exclude from patentability: (a) diagnostic, therapeutic and surgical methods for the treatment of humans or animals; (b) plants and animals other than micro-organisms, and essentially biological processes for the production of plants or animals other than non-biological and microbiological processes. 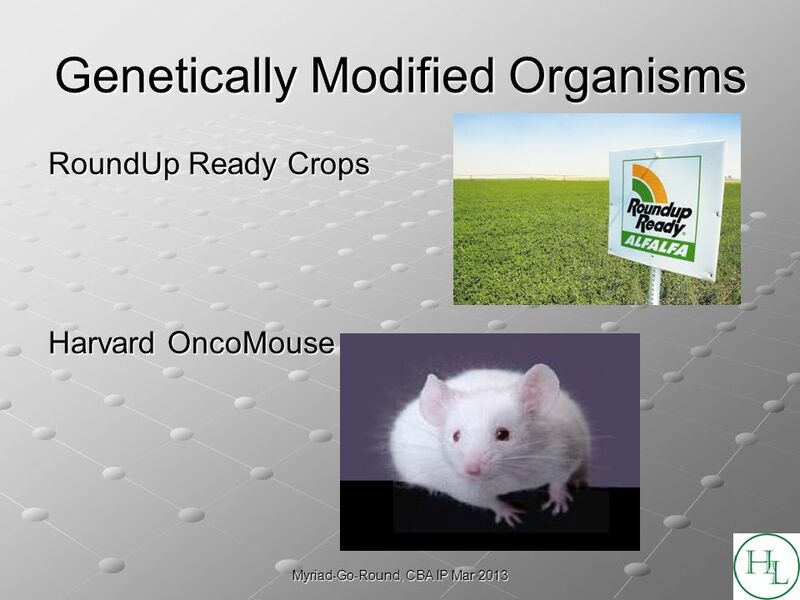 However, Members shall provide for the protection of plant varieties either by patents or by an effective sui generis system or by any combination thereof. The provisions of this subparagraph shall be reviewed four years after the date of entry into force of the WTO Agreement. 36 Myriad-Go-Round, CBA IP Mar 2013 US Experimental Use Exception It has been held, and no doubt is now well settled, that an experiment with a patented article for the sole purpose of gratifying a philosophical taste, or curiosity, or for mere amusement, is not an infringement of the rights of the patentee. Peppenhause v. Falke, 19 F. Cas. 1048, 1049 (C.C.N.Y. 1861). 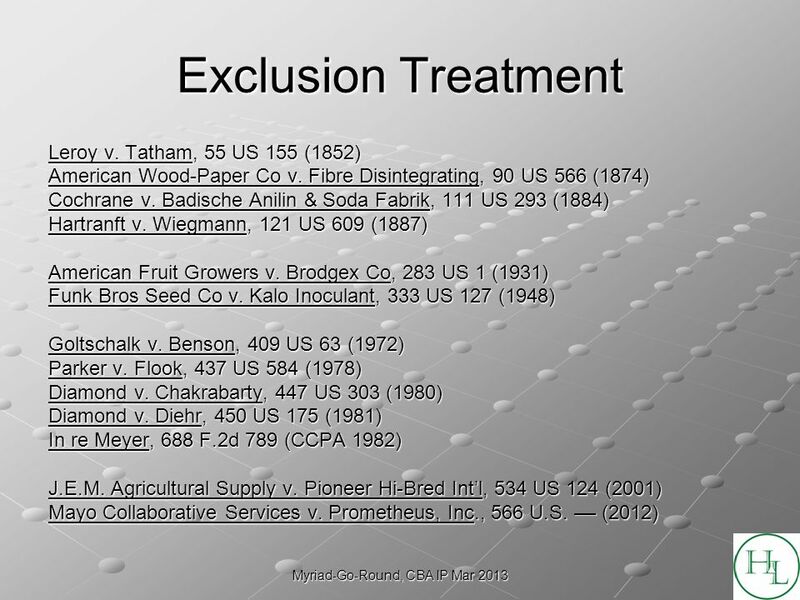 Although the courts recognize an exception to patent infringement known as the experimental use privilege, this judicially created doctrine has been described as very narrow and rarely applied. 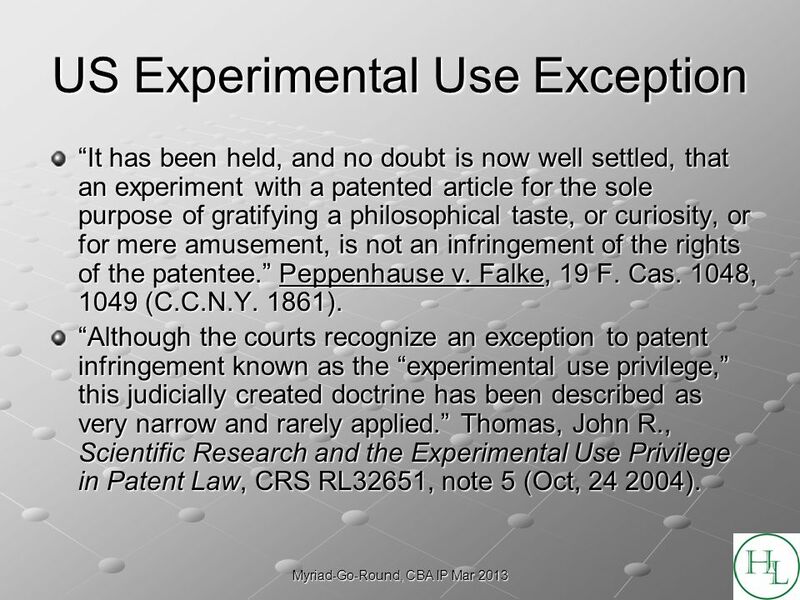 Thomas, John R., Scientific Research and the Experimental Use Privilege in Patent Law, CRS RL32651, note 5 (Oct, 24 2004). 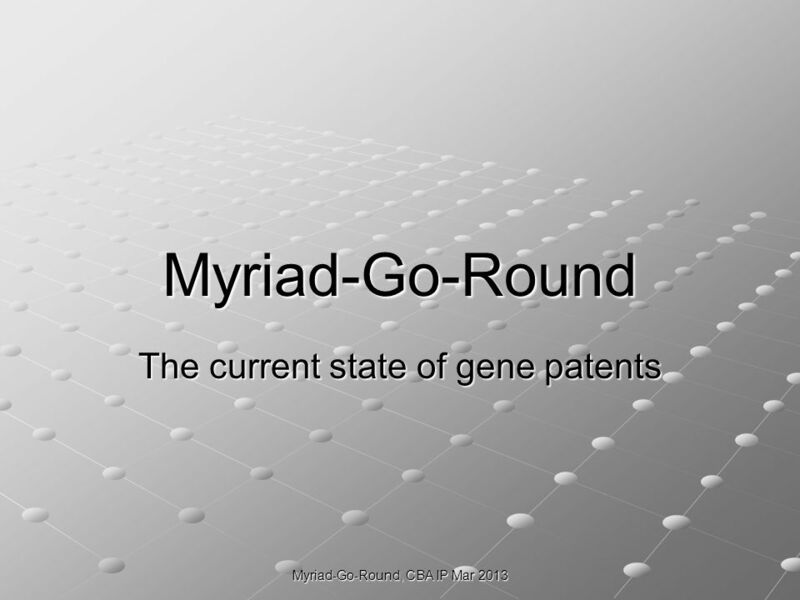 Download ppt "Myriad-Go-Round, CBA IP Mar 2013 Myriad-Go-Round The current state of gene patents." PATENTS IN BIOTECHNOLOGY presented to the IEEE Engineering in Medicine and Biology Buenaventura Chapter Nicole Ballew Chang, PhD Lauren E. Schneider, Esq. National Human Genome Research Institute National Institutes of Health The Future of the Research Exemption A Presentation to the Gene Patenting Roundtable. 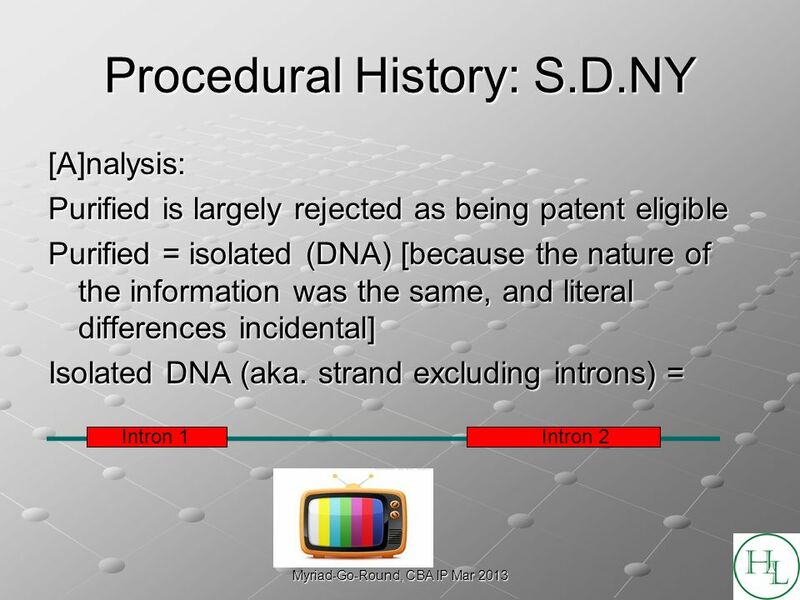 Innovation - Lab National Institute for Standardization And Industrial Property Patenting procedure Overview. Institut der beim Europäischen Patentamt zugelassenen Vertreter Institute of Professional Representatives before the European Patent Office Institut des. CAMBRIDGE UNIVERSITY UK Robinson College – Faculty of Law 23rd Annual Fordham Conference Intellectual Property Law and Policy 8 – 9 April 2015 Patent Session. 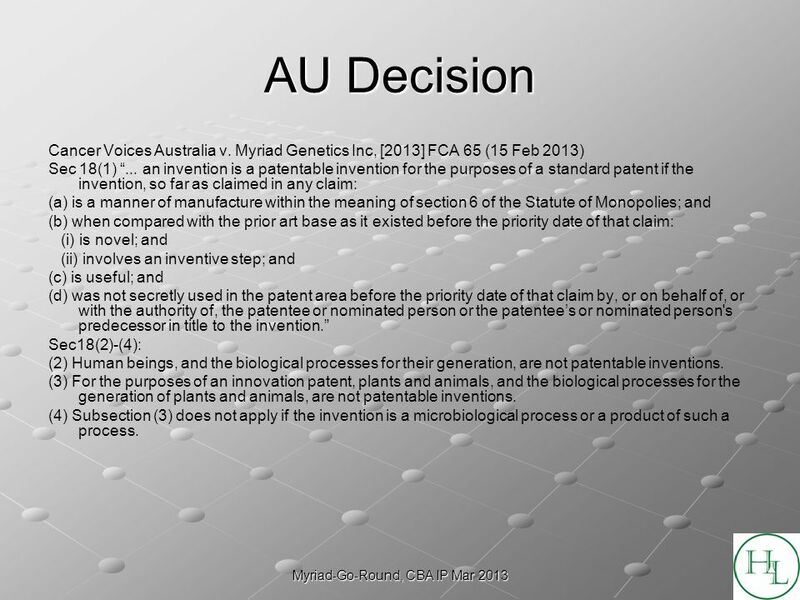 Interface between patent and sui generis systems of protection of plant varieties The 1978 UPOV Act does not allow both systems to be applied to the same. 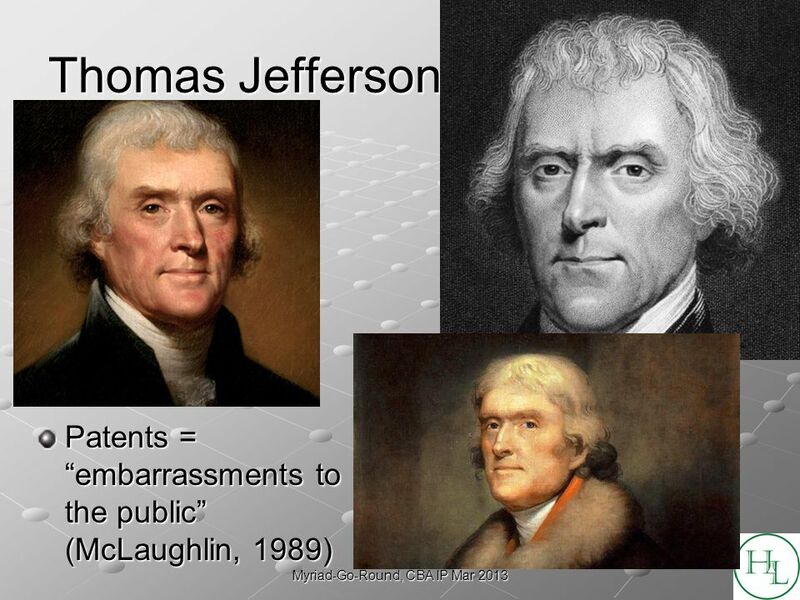 Thomas Jefferson. A letter to Isaac McPherson August 13, 1813 Xavier Sala-i-Martin Columbia University. * Statements of fact and opinions expressed are those of the speaker individually and are not the opinion or position of Research In Motion Limited or. In re Bilski (Fed Cir. 2008) Patentable subject matter In re Bilski (Fed Cir. 2008) Patentable subject matter December 2, 2008 John King Ron Schoenbaum.